Sarasota County has released its 2016 Annual Report, “which takes a comprehensive look at the county’s most important projects, programs and initiatives and how it is meeting its goals,” the county has announced. 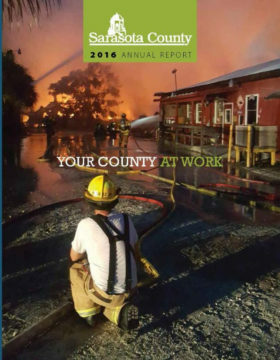 The public may view the report online at www.scgov.net/CountyAdministration or https://issuu.com/sarasotacounty or pick up a copy at county offices or at any county library, while supplies last, the release points out. For more information, call the county Contact Center at 861-5000 or visit www.scgov.net (keywords: annual report).